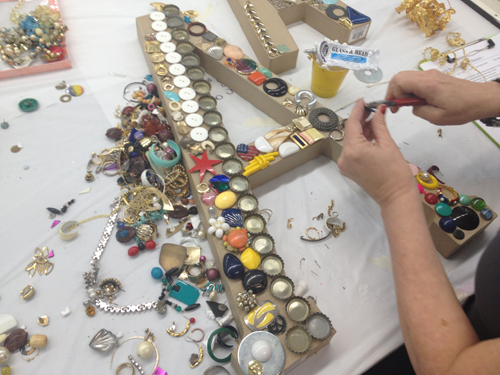 Have you been wondering what to do with all the trinkets and odds and ends you have laying around in your craft drawers and bins? 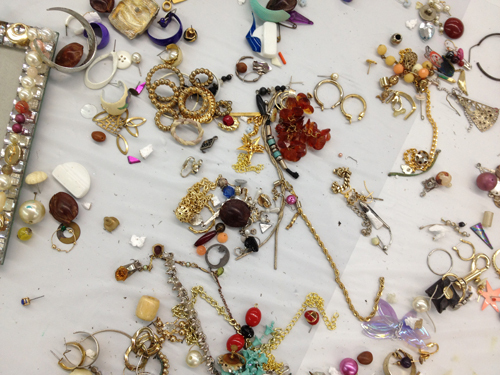 Here's the perfect project from designer Pattie Wilkinson to put them to good use. 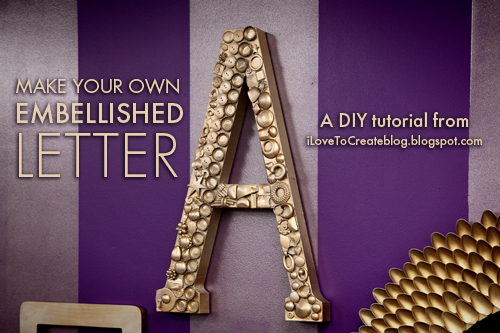 This pretty and chic DIY wall art is so easy to make and can be accomplished in an afternoon. 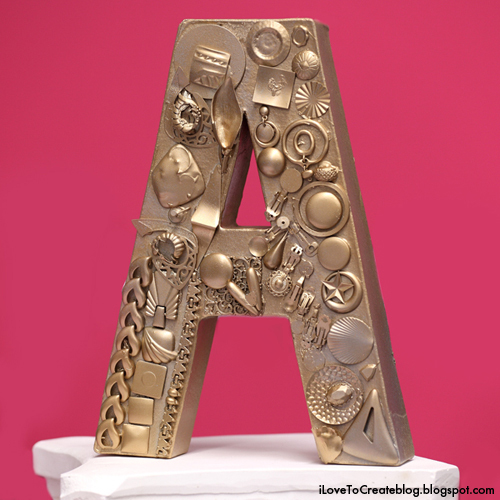 Artfully arrange your items on your paper mache letter. 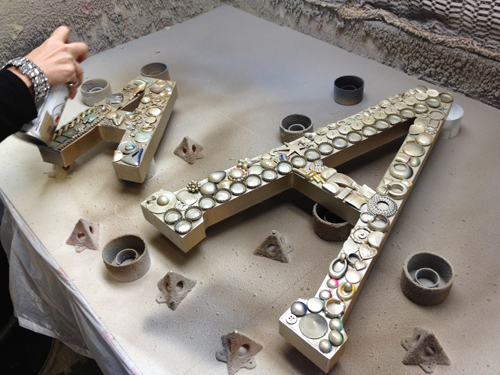 Apply to letter using a dab of the glass and bead glue on each piece. You may need to cut off any sharp parts or details using your wire cutters. This is what they will look like when completed! 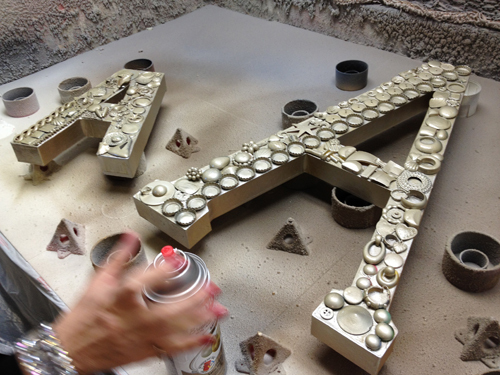 Apply a coat of spray paint to the front and back of your letters. Add another coat so that you get full and even coverage over the entire letter! That's it! 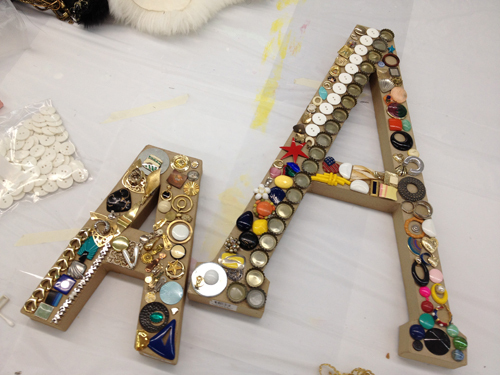 You have an artfully collaged letter that is visually interesting! Your friends and family won't believe that you recycled all those odds and ends making it! Ya know, I also like it better without the gold paint! I have to agree it looked better with the assorted jewel colors maybe paint it gold first for an even background color then apply the trinkets. I very much like the finished gold, but I wouldn't limit it to that color...how pretty would it be in maybe purple...or pink...or yellow...or...well...you get the idea. ENDLESS OPTIONS. i also prefer them without the paint, strange that isnt it. You shared such a nice article I feel strongly about it and love learning more from this stuff. This is gorgeous! It really looks more fabulous with the gold paint! Thanks for sharing your idea Pattie! Bulunmaz offer CNC machinery, high precision diamond tools and related products. Long years of production, R&D and marketing of diamond cutting tools and related machinery, gave us the ability of understanding the market needs. Today we are proud to be the major supplier of products related with any level of diamond cutting from basic hand cutting to high-tech CNC machining centers. Such a great blog post with attracting photos. It's a real art. Please do share more good content like this!